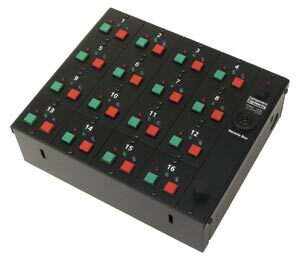 The Remote Control/Status Indicator Box connect to the two-wire data link and can be configured to communicate with up to thirty-two TA-10, TA-10 DX, and DA-10 automations. A set of three LED indicator lights show when the projector is ready, starting up, running the show, and shutting down. Those units in Interlock are also shown. Any projectors not in Interlock can be started from the Remote Box, and any (including those in Interlock) can be stopped. A Status-Only (no push buttons) version is also available. Terminals are provided inside the box for a "Panic" system shutdown. These are intended for connection to a house master fire alarm. An alarm sounds in the event of any failure and there is indication of which projector is in trouble.